This is an amazing sinkhole deep inside the jungle, an upstream branch of the Dos Ojos system. 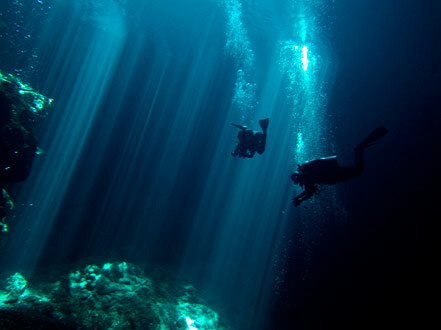 The Pit is the deepest cenote in the state of Quintana Roo with a depth of 391ft/119 mts, therefore, can be visited by experienced advanced divers only. Obviously we can only descend to 130 ft. The jump into the water could already an unforgettable experience (24 ft) but not necessary anymore since we have a new platform and staircase. Light effects, especially long light rays penetrating the blue water are amazing. A truly unique place with a white hydrogen sulfide cloud at the depth of 100 ft. Below the cloud you can see the remains of what seems to be an old fire place with small burnt bones, black lines on the wall showing the variation of the water level through the ice ages and a beautifully decorated ceiling with thin, white formations.